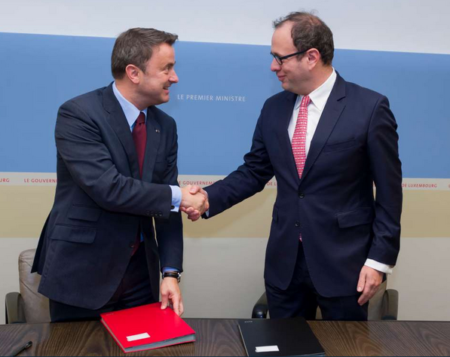 On the occasion of this signature, Frédéric Genta, an interministerial delegate for the digital transition, visited Luxembourg to meet Prime Minister Xavier Bettel. After having discussed with the Prime Minister, Frédéric Genta visited a Luxembourg data centre, which is a reference in Europe in terms of “green IT”. The agreed partnership will allow the two countries to share experience on topics of the future such as the dematerialisation of administrative procedures, e-health or the creation of a digital identity for each resident. A strategic priority for Monaco is to find a solution for protecting certain data against the risks of cyberattacks or natural disasters, something that is impossible to do on a national territory of only 2 km2. Monaco and Luxembourg will therefore also launch a study on the possibility to host such sensitive data in a Luxembourg data centre with similar guarantees of immunity and privileges as those of an embassy. Estonian data is already hosted in Luxembourg according to this model. Sensitive data from NATO and the European Union is also stocked here. Prime Minister Bettel highlighted that this partnership on digital innovation strengthens Luxembourg’s role as a trusted digital hub in Europe.